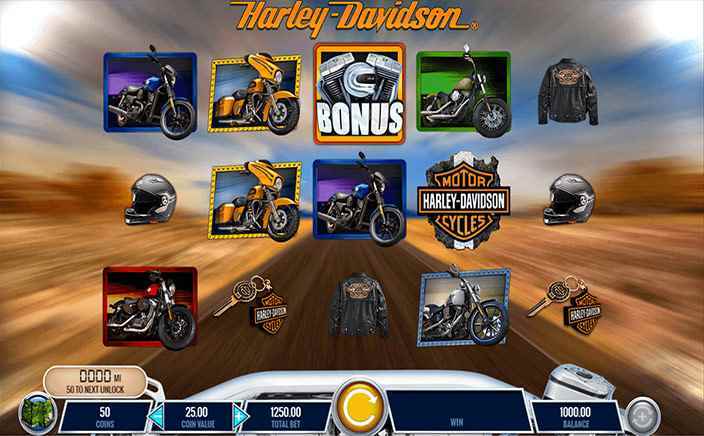 Harley Davidson Freedom Tour slots is a new amazing game launched by IGT. This slot game has unique as well as rewarding bonus features which are going to be loved by slot players. This slot game also comes with a medium variance and one can squeeze a maximum jackpot of 2,500 coins during their gameplay. This video slot is playable with a maximum betting sum of £50.00 and a minimum betting amount of 50p per spin. 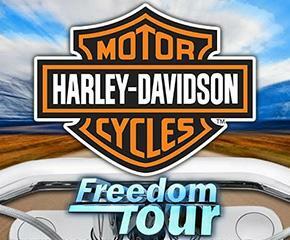 Harley Davidson Freedom Tour slots is designed with 5 reels and 30 active paylines. The reels are well portrayed against the background of an open highway and the reels are set against the scene of an engine. This slot game is well optimised on most mobile devices which makes it quite easily accessible for slot players. You also have an RTP of 96.03% in this slot. Visually, when it comes to icons it includes a very wide range of the hottest Harleys available and lots of exciting perks like helmets, keychains and leather jackets. The Harley Davidson Freedom Tour slot game logo is recognised as the wild icon and this will replace for all other icons available on the reels except for the game’s bonus icon. The Bonus icon simultaneously appears on reels one, three and five, it will activate the game’s ‘Road to Riches Bonus’ round. After which, players will come across a bonus wheel where they can win prizes of up to 200 times their wagered amount. Moreover, there is the ‘RPM Multiplier Slice’ round where repeated engine revs will increase win multipliers – 2x or 5x win multipliers may be applied to the additional spin on every cash prize on the bonus wheel. Free Ride Free Spins– here players get three free spins. On the first free spin, one icon becomes wild wherever it is visible on the reels. On the second free spin, one more icon becomes wild. On the third and final free spin, one more icon also transforms into wild giving three extra wilds on the reels. Showroom Bonus– the backdrop is occupied by a bike showroom for a pick’em round. Harley boxes will be on display with cash prizes, multipliers or cash plus picks available. After which, players get ten picks with multipliers which get increased by as much as a 5x multiplier. Custom Shop Bonus– here players will select from lug nuts at the backdrop of which hidden bike icons are located. You will try to fill a meter by using similar logos and win the associated prize. Harley Davidson Freedom Tour slots is a game with alluring graphics, fascinating animation and an electrifying soundtrack on offer. It includes abundant free spins and multipliers to keep players hooked.